Log Swimming Pool Enclosure – Create a wonderful atmosphere for your pool! What makes a log swimming pool enclosure so special? Well the timber provides a beautiful, warm and inviting atmosphere for a pool. Wood also has a very calming and relaxing feel to it. Timber as a natural product, does breathe as well and so in this environment of high humidity, with all the water present, the timber will help to relieve this problem, unlike other types of material. The harsh chemicals found in swimming pools also attack metal and cause serious corrosion, (if not protected properly). Wood is not affected is this way and so structurally a log swimming pool enclosure is a good option. What aspects of a log swimming pool enclosure need careful investigation? The logs themselves are an integral part of the structure and are therefore very important. There are many different types of logs and their quality can vary considerably. If you want to know more about how to choose good logs, then please visit our dedicated log section. In respect of a log swimming pool enclosure specifically, the relationship between the pool itself and the logs is crucially important. All at costs use a design which in a proper way, deals with the possibility of water from the pool coming into regular contact with the logs. The base log should be well above floor level, sitting on some type of masonry wall, so that water will not come into constant contact. I would recommend a minimum of 6 inches or 150mm to be used for this aspect. It also makes sense not to have the outside of the pool too close to the logs. By doing this you are minimizing the chances of the water getting on the logs by splashing and just general usage. Remember children may use it and they won’t worry about water getting spread around!! 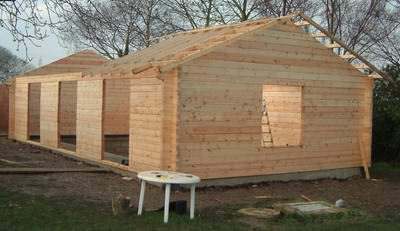 A log swimming pool enclosure, will often be a large building. As such a vaulted or cathedral type ceiling, will give the room a much more spacious and airy feel. Often to use end a portal frame structure (such as the one shown in the picture above), can provide the ideal answer. 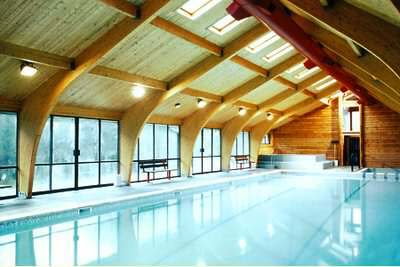 Glulaminated beams will perfectly compliments the logs and also provide a very strong option, where larger pools and therefore roof spans are needed. Natural light is important and many people also like to take advantages of the view outside and use plenty of glazing as a result. Roof lights (such as Velux or other similar products), can be a great way to increase natural light, particularly if glazing the wall is restricted by proximity to other buildings or for structural reasons. As we have already mentioned try to design your log enclosure with plenty of space around the pool, so that you have lots of room to walk around, sit and also keep the water away from the logs. Also think about the equipment you need to run a swimming pool. Many people will create some kind of pump room with external access, to keep the equipment out of the main area. This has a couple of major advantages, in reducing the visual impact and noise of this equipment, while also allowing easy access for maintenance and repair work. One thing that can not be stressed enough with swimming pool enclosures, is that you MUST have good ventilation. Poor ventilation in such a wet environment will result in problems with excessive condensation. Although timber is normally treated to inhibit the intake a moisture, prolonged and regular exposure to high levels of moisture, will lead to issues in the long term. Make sure that your use and maintain a ventilation system that has been properly designed for such a use. Do not skimp in this area, ventilation is vital to ensure your timber is not adversely affected in time. As previously mentioned, the chemicals contained within most swimming pools will cause corrosion in metal. It is therefore very important that any metals used in the structural elements of the building are properly protection. Certain processes like galvanizing are good in this regard, but are also very costly. With structural elements which can not be seen (e.g. a roof truss which uses metal truss clips), using a rubberized paint to seal around the metal and keep the water away from contacted the metal, can be a good option. It also pays to inspect metallic elements periodically to ensure that no corrosion is taking place. Insulation in a log swimming pool enclosure is important, as heat loss can be quite costly in a large area like this and also temperature difference can lead to increased condensation levels. Also try and install high levels of insulation to maintain a nice temperature, without the need of excessive heating. Try not to have the temperature too high inside your pool enclosure as well, as again too large a temperature difference from inside to outside, will only increase the condensation levels. Heating your swimming pool is not cheap, so also think about good pool covers and construction methods around the pools, to minimize any heat loss from the pool itself.